Today's theme is action figure variations. These are different from variants. Variants are toys with (usually minor) alterations that occur in the production run of a particular figure; in a collectors' market, these figures, being relatively rare, often fetch higher prices. Variations, on the other hand, occur when a toy company releases a figure that has already been released - but this one is wearing a new and, more importantly, a completely pointless costume. My target this week is Mattel. Now I want to say off the bat that, as a huge He-Man fan, I have been more than pleased with the way Mattel has handled the revamp of my childhood hero and his freakish allies and enemies. That said, recently Mattel has made a few moves that I think warrant some (mild) censure on the part of this fan. At the recent San Diego Comic Con, Mattel introduced four figures - He-Man, Man-At-Arms, Skeletor and Battle Cat - in "Samurai" outfits. The costumes were reminiscent of the Samurai-themed figures released by the likes of McFarlane Toys (whom Mattel's sculptors, the Four Horsemen, once worked for). I'm not going to play any guessing or blame games as to whose idea these figures were; I would hazard a guess that at least some market research was involved, regardless of whose idea the figures were. "He-Fans" quickly jumped on these variations for a number of fairly obvious reasons. First off, what was He-Man, a person from the fictional fantasy world of Eternia, doing in samurai armor? Second of all, even if he is wearing samurai armor, why is he on stilts? Yes, these figures were all (with the exception of Battle Cat) wearing stilts. One would think that stilts would hinder martial arts tactics, what with the awkwardness of movement and all. It's hard to whip out with a ninja kick when you're trying to balance yourself two feet off the ground. But Mattel didn't stop there. In December we get "Smash Blade He-Man" and "Spin Blade Skeletor." SP Skeletor is Skeletor with a red-and-black paint scheme on his armor and a spinning weapon; He-Man doesn't even have the repaint job, just a spinning weapon. Then there's "Martial Arts Blade He-Man" and "Power Gauntlet Man-At-Arms" - two more bizarre, pointless variations. I know that when I was a kid, I never wanted these stupid variants. I wasn't interested in Battle Armor He-Man very much for the simple reason that He-Man never wore that outfit on the show. 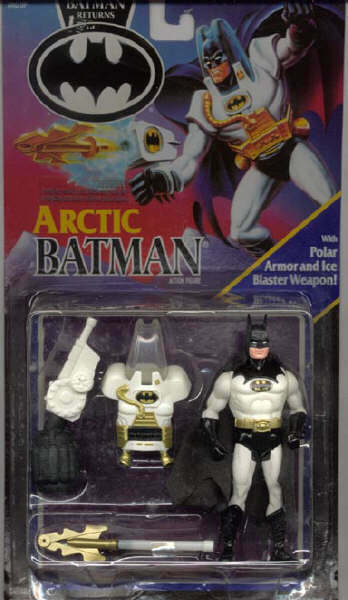 But varations were rarer in those days; it was Kenner (later Hasbro) who opened the floodgates in 1992 with the hideous travesty that was Arctic Batman. This hideous, pointless variation (which appeared in the Batman Returns line, though Batman wore no such costume in the film) is a direct ancestor of today's Soccer Player Spider-Man and Martial Arts Blade He-Man. Why have these variations? I'm not sure. Perhaps there is market research that indicates kids like having the main characters over and over; yet, the only figure I'm seeing on the pegs at the toy stores is He-Man and Deluxe He-Man. Playmates learned this lesson, too; initially they tried to save money by reusing molds, giving us a Bart and Homer with every wave. Now we get more obscure characters than anyone would ever want. Fans, for example, note that the Boba Fett action figure, far more than the character's small role in the trilogy, helped to make this character a favorite among digital filmmakers. The fans, as children, had fleshed out Boba Fett's intentionally murky character, giving him (or her) a personality, motives, goals, and conflicts, which helped to inspire the plots of a number of the amateur movies. Obviously, Boba Fett was one of the most popular action figures ever made - and he was anything but a main character. The Masters of the Universe (MOTU) line contains dozens such characters, particularly the villains, that could be explored before Mattel should bother with variations on the main characters. At the very least, they should make variations that make sense. Will He-Man be suiting up in stilted samurai gear on the cartoon sometime soon? And then, just for kicks, he'll also try on some similarly-themed martial arts clothes? Never mind Jungle Attack He-Man (aka Rambo He-Man) who's hitting stores right now. I think what worries me the most is the cynical notion that keeps tickling the back of my mind - the idea that Mattel is up to its old tricks, reusing molds to save money. Since the relaunch began, Mattel has consistently said they are committed to doing He-Man right. One poster on the He-Man board claimed to have spoken to a Mattel representative, who indicated that Mattel was surprised by the powerfully negative reaction to the samurai figures. Here's hoping Mattel takes a hint from both Playmates and toy history and gives us more regular line figures instead of dozens of variations.